During the summer our dogs enjoy their well-deserved rest. They play a little in our field and relax in the shade of their kennel. To maintain their health lifestyle we take them on long walks around the breathtaking landscape and you can experience that! Feel the pull of our athletes and let yourself be transported throughout the forest, swamp and pasture. You can also come by for an informative tour of the kennel with coffee/tea by the fire in our tipi tent or outside. We can shorten or lengthen the walks on request. Please let us know if you have any questions or concerns on how we can accommodate your party – We are flexible and open to all suggestions! 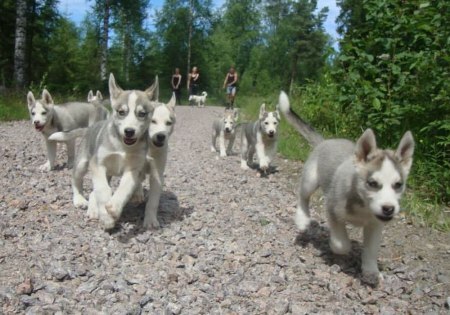 Meet our 27 happy Siberian snouts. Cuddle and stroke them and see how hard they can run. You get an informative tour of the kennel and then we drink coffee, tea or lemonade with something tasty. Additional Adult: 100 SEK p.p. Additional Child: 75 SEK p.p. After the kennel visit, we can enjoy coffee, tea or lemonade with a nice treat around the fire. You will then get a special walking belt that sits around your stomach to ensure a comfortable walk. 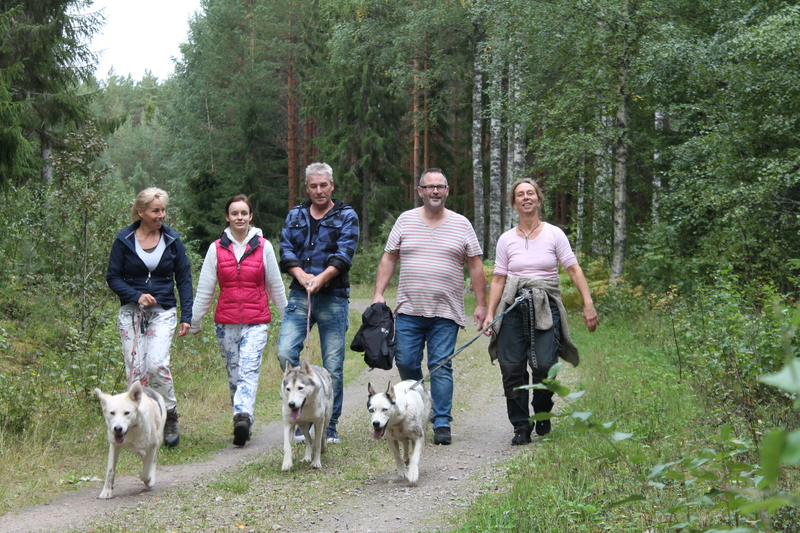 Once fitted, we will attach one of our excited huskies and set off for a beautiful walk through the woods. Small children will receive a special walking line that is attached to an adult. This way everyone can experience handling the strong huskies! The walk is approx. 3-4 km and suitable for children 5 years and up. After we have visited the kennel, we drink coffee, tea or lemonade with something tasty by the fire. You will then get a special walking belt that sits around your stomach to ensure a comfortable walk. 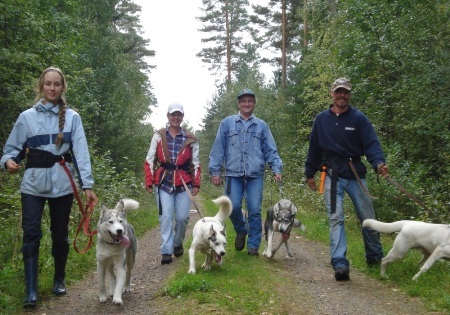 Once fitted, we will attach one of our excited huskies and set off for a beautiful walk through the woods. Small children will receive a special walking line that is attached to an adult. This way everyone can experience handling the strong huskies! Additional Child: 50 SEK p.p. After the kennel visit, we can drink coffee, tea or lemonade with something tasty by the fire. You will then get a special walking belt that sits around your stomach to ensure a comfortable walk. Once fitted, we will attach one of our excited huskies and set off for a beautiful walk through the woods around our house. Small children will receive a special walking line that is attached to an adult. This way everyone can experience handling the strong huskies!